Josh B King | creative. barely. 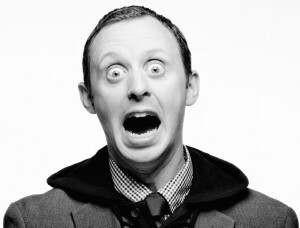 Blogs don’t have to be scary. They don’t have to be long or long-winded. They don’t have to lecture or be too nice. 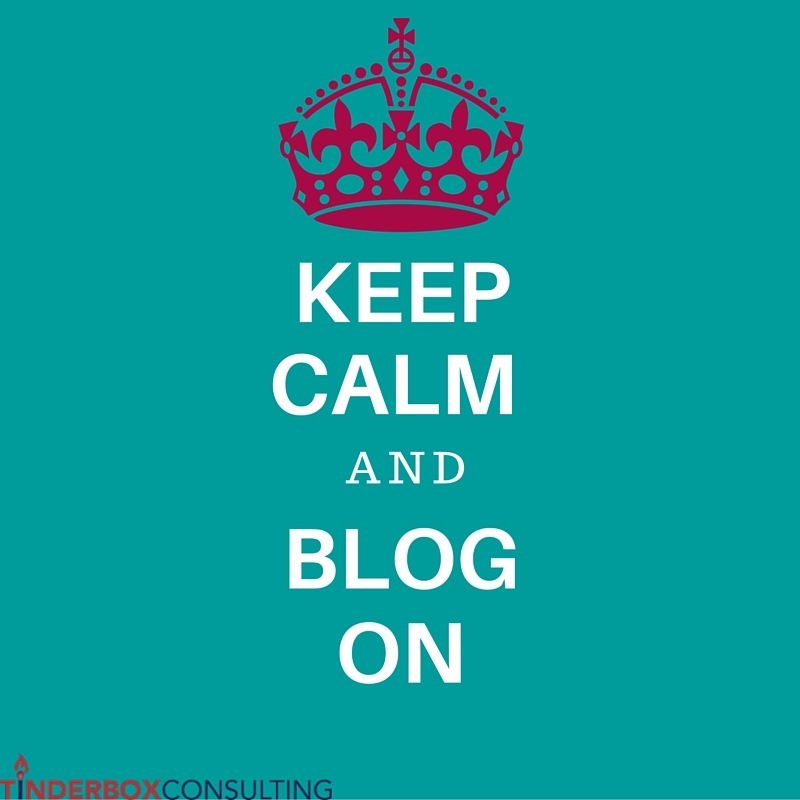 And blogs certainly don’t have to be time consuming. Seth Godin writes about a blog a day. Most are about a paragraph long. And most of his blogs are good. That’s the key to writing blogs. They just have to be good. They have to add value to someone’s life. Oh, and they don’t have to be for everyone. 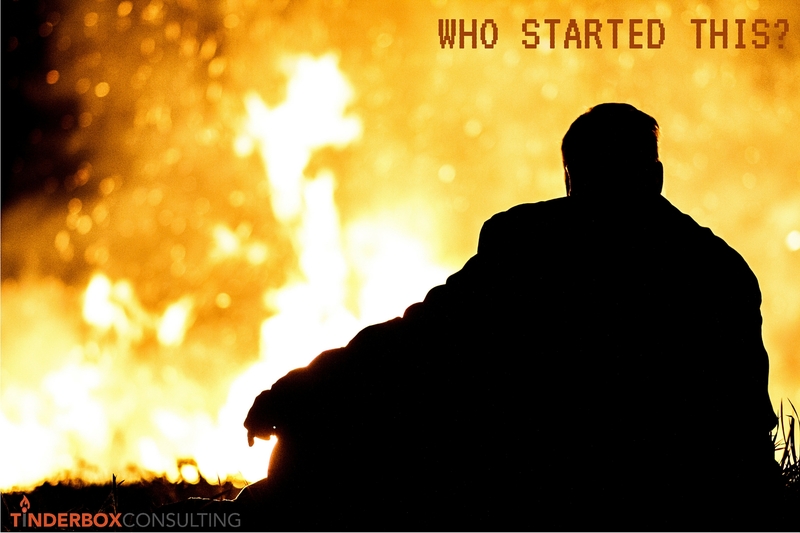 I didn’t start Tinderbox Consulting. I believe in God. I am a Christ Follower. Three years ago, when I found myself unemployed (again), I was determined to get another “real job.” God had different plans. 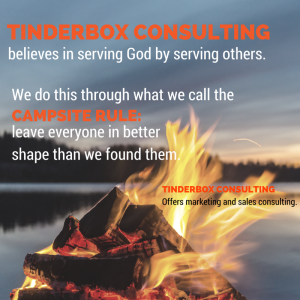 Because I listened and obeyed God, because I had faith in his plan for me, Tinderbox began. And because God is so good – despite my faults – Tinderbox remains, three years later. It’s also how I can be at peace, even when the business waters are rough. And why I can’t rest when a client isn’t satisfied. I feel compelled by a greater mission: to serve God by serving others. Being mission driven means I can be confident God will bring in more clients, and that I’ll find new opportunities to serve existing clients. It also means I’m responsible to apologize when I mess up with a client. No you won’t. And we both know it. It’s not because I don’t trust you. It’s because I do the same thing. I’m running late and am embarrassed that I’m running late so I text you to let you know. I tell you I’m only five minutes away, when really, I’m easily eight minutes out. Why? Because I want to believe I’m not that late. I hate being late. But I hate being a liar more. So now, I try to be honest or even exaggerate. If I know I’m going to be five minutes late, I say 15 minutes. If I’m going to be 10 minutes late, I say 20. More importantly, I apologize and ask for forgiveness. Their time is just as valuable. Overstating how late I am accomplishes two things. 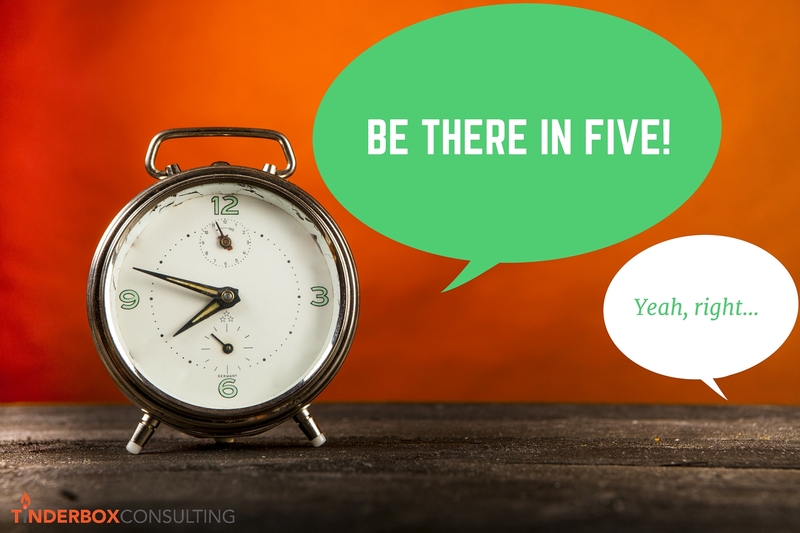 1) I’m honest about running late and I give myself breathing room to get to the appointment. 2) If I’m earlier than I stated, it feels like a win. The easy choice is to just keep assigning work to team members that shouldn’t be doing that work and then beating your head against the wall when that work stinks. An ineffective team member may be more of an indication of ineffective team leadership. The bait and switch method on Twitter doesn’t build your brand, but it does do a great job of destroying your character. Let’s define this for clarity. 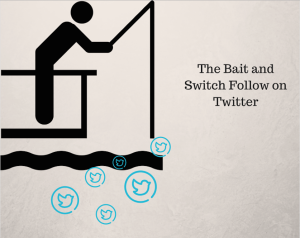 A Bait and Switch Follower is a person or brand that follows you on Twitter. However, once you follow back they unfollow you. The strategy here is to grow their own followers while keeping the accounts they follow at a smaller number. This would give the illusion that this person or brand is popular, as well as exclusive: they only follow back prestigious accounts. If you’re a pastor, a blogger, a writer, a CEO or a general good person, this method is embarrassing. You aren’t building trust, brand equity, favor or loyalty, you’re just building followers. What’s more important to you, growing followers or growing your business? I believe in reciprocity on Twitter. If someone follows me and I appreciate their content, I typically follow back. I then monitor my followers fairly closely with Commun.it. Using Commun.it allows me to see who continued to follow me after I followed them back. There’s no fast way to the top when it comes to social media. Buying followers or likes, bait and switch following strategies, they are all fools gold. The only real way to grow your social channels is through quality content, real engagement, and a solid strategy for growing followers and likes. Social media has a tendency to drive a wedge between people and, well, other people. It’s why tweetups are a thing. I can be social on social media all day long, but that’s not an adequate replacement for real human interaction. It’s just not. After attending several #SpoCT’s, and enjoying them, I thought it would be fun to start a tweetup centered around craft beer. So I did. And I called it #Spokane #BeersUp, which was a clunky if not effective name. 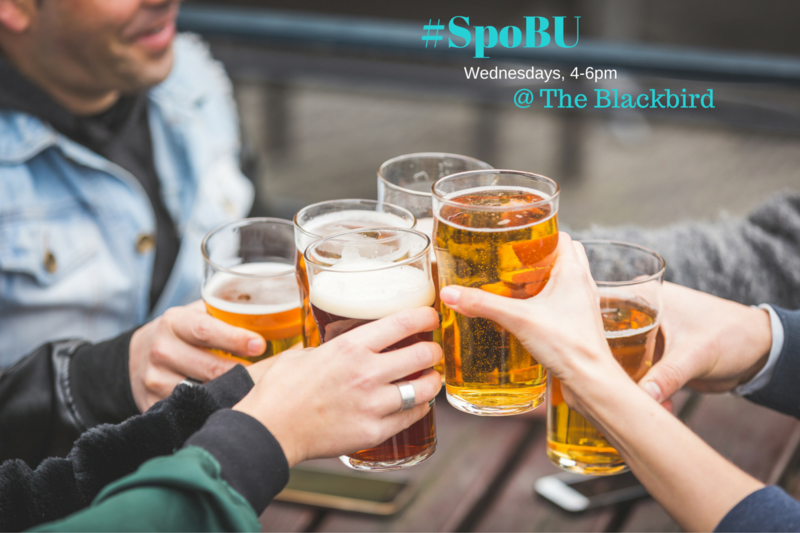 After a while, it was condensed to simply #SpoBU. The point is, I need to be social beyond business meetings. #SpoBU gives me an excuse to hang out with a few friends and enjoy a cold one. I need #SpoBu. Companies, heck even people, need a mission. Most companies and organizations operate from a mission statement, vision statement, or beliefs statement. According to Wikipedia, a mission statement “is a statement of the purpose of a company, organization or person; its reason for existing; a written declaration of an organization’s core purpose and focus that normally remains unchanged over time.”Our mission statement follows a formula borrowed from Simon Sinek, often referred to as a WHY Statement. To create the WHY Statement, a paragraph is constructed using three elements: why an organization exists, how the organization does what it does, and what the organization does. At Tinderbox Consulting, we believe we can serve God by serving others. We use a philosophy called the campsite rule, leave everyone in better shape than we found them. Much like you would a campsite after a weekend of camping. This is done by working diligently to serve our clients and put them in a better marketing position than when we found them. Creating a marketing plan is one thing. Executing said plan is quite another thing. This is how we operate. Create and execute marketing plans, and leave our clients in better shape than we found them. 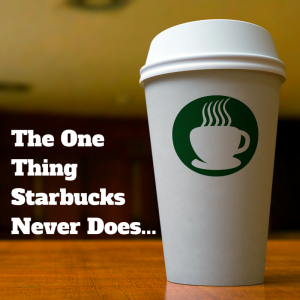 The one things Starbucks never does is ask me to leave if I am there just to enjoy the free wifi. I can set up shop for twenty minutes or three hours and never order a coffee, Frappucino or Chicken Artichoke Panini on Ancient Grain Flatbread. 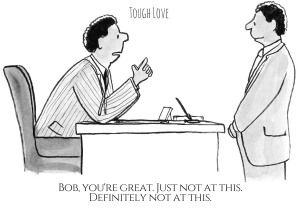 Your customers are going to be tough on you. You may think it’s personal, you may think it’s unfair. 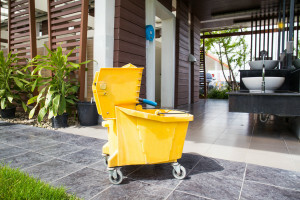 But, as a business owner, you need to accept the fact that your customers are going to judge you, and in some cases, they may not even be nice about it. Here’s a hypothetical situation: you go out to eat to a new restaurant, and It’s your first experience there. The dining room is clean and well-decorated, and the staff is all friendly and professional. The food is served and it’s amazing! Then you look over, and in plain view, next to the hallway to the restroom, is the mop bucket left out in the open. You wonder that if the hallway is left in this condition and you can see it, what about the kitchen you can’t see!? Sounds harmless, right? It could even be construed as positive reinforcement that I’m doing good work. Except, this was said by someone I thought was going to want me to mentor him. “I’d love for you to be my mentor, but you’re too busy.” When I heard that, my heart sank. I thought, what am I too busy doing? What’s more important than pouring faith, knowledge, life, and love into someone else? I’ve been called nearly every name in the book, and in most cases it was deserved. But this…this was worse than any name I’ve ever been called. Because it’s true, and it’s my own doing. A friend of mine once said that life is about creating margins. Margin for the things that are important, margin for the things that are necessary, and the things that are required, and margin for the things that fill our cups. It looks like my margins need to be redrawn.